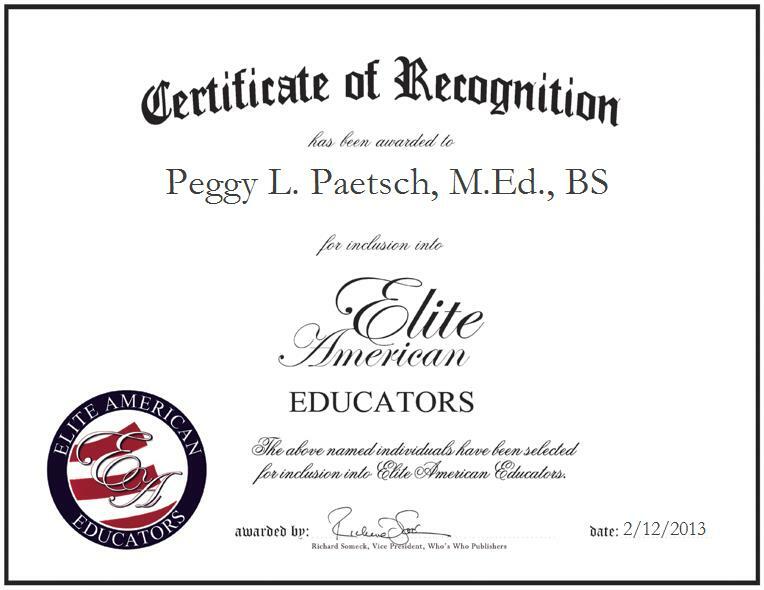 Peggy L. Paetsch, M.Ed., BS is a Reading Specialist for the George T. Wilkins Elementary School of Indian Spring School District 109. With a refined and sophisticated skill set in the tutelage of struggling readers and instruction of first-grade students in the area of reading, Ms. Paetsch makes the most of her talents as an educator when overseeing a caseload of 20 students working to overcome challenges with reading. She also works with classroom teachers, monitors the progress and benchmark data of her caseload, and serves as a parent liaison. Ms. Paetsch has been a guest presenter at a Graduate Course at Saint Xavier University, a facilitator for other teachers at District Professional Development Courses, and a Title I Parent Liaison for the local district.